There is now a good range of upright exercise bikes with an iPad holder. They range from under $200 to under $1000 and beyond. When you search for this you don’t get much of a selection – in fact it seems that there is just one bike and that is the Innova XBR450 (a folding exercise bike). To help in making the search a little easier I’ve gone through the bikes to find those that have a media shelf that can hold an iPad rather than just the one that is described that way. They’ll also hold a tablet. In selecting the bikes to make the list I didn’t just use the ipad holder as the sole criteria, I also ensured they delivered on providing an effective low impact workout too! This bike comes with an ipad holder that measures 10.5 by 7.5 ins with sucker pads to hold it it in place. It is up above the basic console so you can still see your measures while you use or watch the iPad. It can be tilted to find the best angle for you to see it as you workout. It doesn’t come with a charger or speakers. You can adjust the seat height and also it’s horizontal position to get the best position for an effective workout. This is not usual for upright bikes under $200. Aside from that this is a basic bike that is best for those looking to get started or wanting a moderate level of exercise. It will leave very fit people disappointed as the resistance doesn’t get tough enough for them. It has 8 levels of magnetic resistance, a console, large pedals it provides a good quiet workout. There are only a few customer reviews at present. They are all positive. You can read my full review here. The Schwinn A10 Upright Bike’s holder is part of the console. It does have an issue that when you place an iPad on the console it covers up the display and control buttons so you can’t see or change your workout without removing it. This is a problem with a number of bikes with holders. This bike does have a number of advantages though. It is priced below $200 (when I checked), you can plug the device into it using an audio cable to play through speakers- program selection and volume is still controlled by the iPad. The speakers are okay, they’re not the loudest but you can hear them easily. The bike also has 8 levels of magnetic resistance and a belt drive so it operates very quietly and won’t interfere with listening to your iPad. This is the best selling upright exercise bike (when I checked). It comes with a lot of features. You also put the iPad on the console but it has 2 displays – so although the larger display is covered the second one can be seen and you can still operate the console. It has an audio cable that you can plug the iPad into the console to use the speakers. Again volume and program selection is still with the ipad. The speakers are okay. The bike operates very quietly so you don’t need them to go to loud to hear your program or music. There is also a USB port that you can use to charge iPad to stop it from draining as you workout. It comes with a large selection of pre-set programs, heart rate control programs and a 3 way speed fan for plenty of choice to keep you on track as well as comfortable. This is similar to the Schwinn 170 with much of the same features with a bit extra. But it does cost more. It has the same arrangement with the iPad holder on the console and having 2 displays. There isn’t a restriction in size of iPad or tablet. You can plug it into console using the supplied audio cable to play through the speakers and get a slow charge by plugging it into the USB port to stop the battery draining as you workout. Other similar features are the 25 levels of magnetic resistance, 12 pre-set programs, 9 heart rate control programs, heart rate strap compatibility. In additiona, it also has bluetooth that can be used to upload workout data to their Nautilus Trainer App. It works with iOS 8 and above and supports Apple’s Health App. This has a similar arrangement for the iPad holder as the Nautilus and Schwinn 170 with it fitting on the display on a shelf. It covers the upper display but you can still use the console and see measures in the lower display. It will be held in their securely as the bike doesn’t move around when its being used. There isn’t a charging port included. It also has an App that works with iOS 6.0 devices and above. You can connect using bluetooth and use it to control and display your measures as you workout. It provides a much better display of these then you get with just the bike itself. It is fairly basic at the moment but it should improve over time. 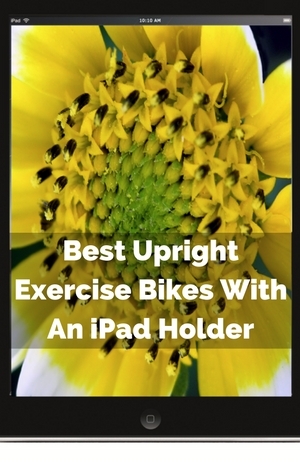 When looking for the best upright exercise bikes with iPad holders, of course, I narrowed it down for those that have a holder. But I did go further than that. I looked at all the features and specifications to ensure they also were good at providing low impact workouts. To make this assessment I’ve read through product manuals, read product listings, asked questions of suppliers and manufacturers and gone through customer reviews to get a complete picture of the bikes. Although it is possible to get a good upright exercise bike with an ipad holder, they aren’t designed specifically for just to hold the ipad. Considering they’ve been around for awhile now you’d also expect to see more of the bikes having a fitness App that works with them too. I’m sure this will happen more as new models are released. But that’s not necessarily what you are after with a holder – you may want to view videos and read etc. It is possible to get a bike at a range of prices that give you somewhere to put your iPad so you can use it as you exercise and also get a good workout – from easy to very hard depending on what you are prepared to pay.